Homebuilding is underway near Cornelius Pass Road. The first residents are expected by this summer. South Hillsboro is finally on the move. 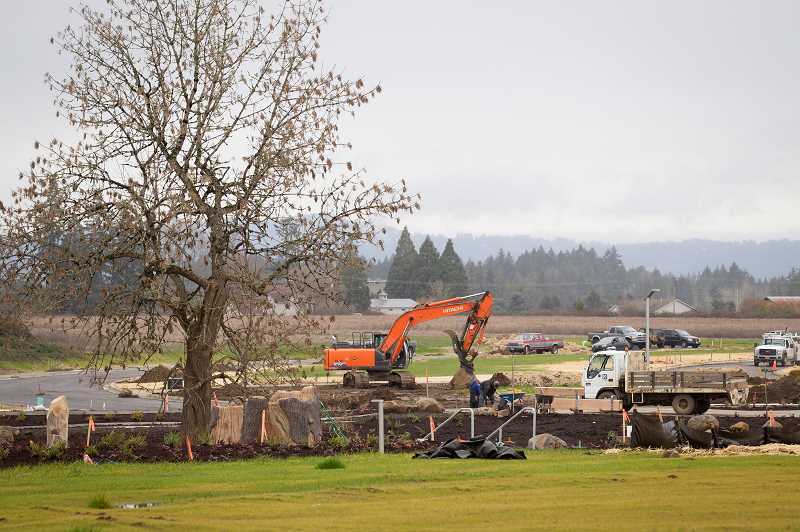 Workers broke ground this month on the newest set of homes slated for South Hillsboro, the massive neighborhood planned along Tualatin Valley Highway at Cornelius Pass Road. Several homes are currently under construction in the neighborhood, according to Kelly Ritz, president of home builder Stone Bridge Homes NW, and the first residents are expected to move in this summer. Developer David Brentlinger of Newland Communities said he expects 15 homes to be built per month, rising to 30 per month at its peak. Phase one will see 300 homes built. 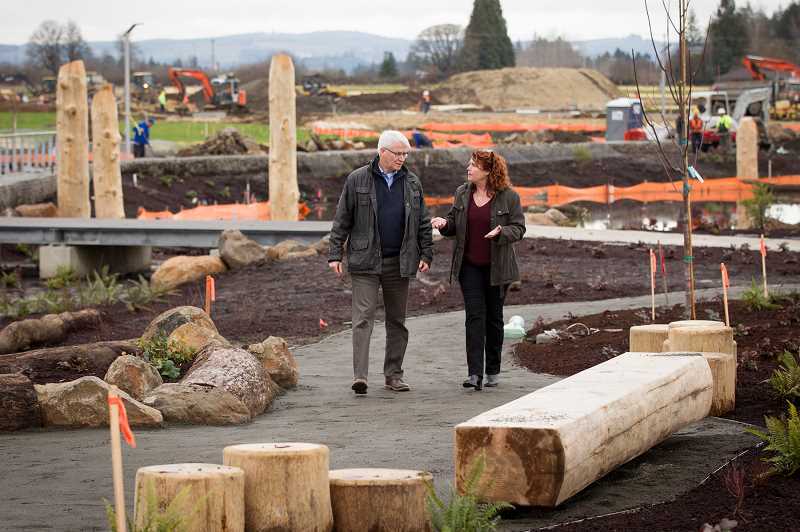 About 3,000 homes in South Hillsboro will be built in an area known as Reed's Crossing, near Cornelius Pass Road. Other areas, known as Butternut Creek and Rosedale Parks, have also begun construction on several homes. The first homes in South Hillsboro were showcased during the NW Natural Street of Dreams this summer, but last week's groundbreaking is one of several major construction projects in South Hillsboro over the next 20 years. When finished, the area will include 15 miles of walking trails, 280 acres of parks and several special bicycle lanes, called cycle tracks, which are separated from other motoring traffic. Newland Communities owns 463 acres of the 1,400 acres that comprise South Hillsboro. Until recently the site has appeared from Southeast Tualatin Valley Highway as newly built roads and concrete curbs and empty lots. Now the first show home is rising up, functioning as a welcome center. The four-bedroom home will have three community reps who can talk about the planned community and speak impartially about the different builders who have bought parcels and are ready with their home designs. The welcome center will have a conference room for real estate brokers and builders to have meetings. It will also have a back patio overlooking the greenway and space to take a virtual reality tour by bike or by foot. Newland bought the farmland with money from investors. It sells parcels to different home builders, some national, some local. They then design, build and sell the homes one by one to the public. Stone Bridge Homes NW, which also built homes at the 2018 Street of Dreams next to the nearby Reserve golf course, is the only local homebuilder. Brentlinger, who is vice president of operations for Reed's Crossing, said the master planned community would aim to avoid the cookie-cutter look of some national homebuilders by mixing in cottages and townhomes with the usual three- and four-bedroom homes. Prices would range from $350,000 to $800,000 respectively. National builders often build large tracts of spec homes in just a few designs. Ritz said buyers could opt for semi-custom homes, allowing them to tweak designs to add a sewing room or make the den into a granny flat. Her company usually builds a house in 120 days. They also will build spec homes available for people who don't have the time or inclination to change the design. The planned community will offer a bikeshare node to encourage people to ride north as far as Salesforce and Intel, and to connect to transit at Orenco Station a mile-and-a-half away.